7 Safety Tips For People Who Live Alone | Calgary Alarm Inc. There are many factors that influence your choice of housing or location, like distance from your workplace, budget, and building rules among others. If your budget is very limited, it can be hard for first timers to afford housing in an ideal place. So, try to research the crime rate for different potential places within your range, and choose the better one. Also identify the safer routes, and those to avoid. When choosing a building to move into, it is important that you take the initiative to find the exit doors and fire escapes. Check the locks and buzzers to ensure they work, and that the exit doors are accessible. Also ensure that all entry and exit points are secure, and plan how you can escape a fire or natural disaster. The first thing that you should do as soon as you move into a new house is to change the locks. You don’t know how many people had possession of the key or access to the house, but you need to keep out everyone who’s uninvited. It’s a good idea to get to know your neighbours. It’s useful to have a network of acquaintances or even friends nearby. If you’re ever feeling unsafe in your home, it’s helpful to know there are friendly faces right next door. When taking a taxi or an Uber, request that the driver drop you in front of your building, rather than trying to save a little money or time by getting dropped off a short distance away. The extra few dollars are worth the peace of mind and safety. 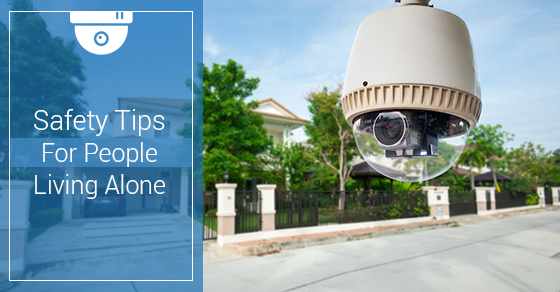 A monitored home security system provides a strong deterrent for potential burglars, helping to keep you and your belongings safe. A pet not only provides a layer of security, but also helps to ease the stress of solo living. Dogs are particularly great for security, though any noisy pet should be good enough. There are also some helpful security apps you can use to raise alarm when you’re in danger. You can also create the impression that you’re not living alone. For instance, you can leave different pairs of shoes on the porch, or leave the lights on while you’re out.